There is no Interface Builder as a separate tool, Now this is part of XCode available as Storyboard. There are many updates in iOS 5, specially memory management. Details column below shares my experience trying these examples on Xcode 4.3.x. There are no Window based application templates while you create new project. 3 Hello World using IB and Code 8:29 First App Development, Create view based app instead of Window based. 7 UISegmentControl using IB and Code 10:01 There can be better way than using switch method, but still trying out switch is good. 8 UIWebView using IB and Code 12:15 Simple nice code. Doesn’t handle failures. 9 UIImage using IB and Code 15:00 You need same size 3 images for this. 10 Delegates 13:46 Nice Step by Step way Delegates explained. 11 UIViewController 6:14 Window applications are not supported in new Xcode. One can use little work around by choosing empty Application. And instead of Add ViewController, you need to add Objective C class inheriting from UIViewController. 12 UINavigation Controller 9:54 Window applications are not supported in new Xcode. One can use little work around by choosing empty Application. 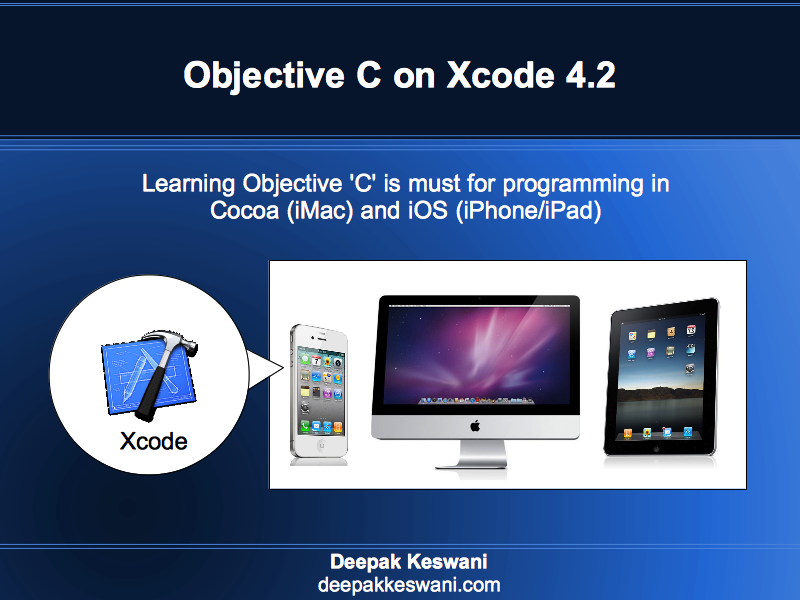 And instead of Add ViewController, you need to add Objective C class inheriting from UIViewController. 13 UITabBar Controller 9:10 Window applications are not supported in new Xcode. One can use little work around by choosing empty Application. And instead of Add ViewController, you need to add Objective C class inheriting from UIViewController. Example is pretty fast and crude, you may need to replay few times. 14 UITableView Controller 8:21 Cell initialization part is not automatically generated. 15 UITableViewCell 6:12 Window Applications are not supported in new Xcode. Choose empty application instead. Cell initialization part is not automatically generated. 16 UIPickerView Controller 8:06 Works Nicely with no changes. 17 UIImagePicker Controller 9:57 For saving the images in the library of simulator, simplest way is to open safari and do image search on google. To save any images just hold your finger on image and you’ll get option to download that image in library. 18 UISplitViewController & UIPopoverView Controller 10:51 Window Applications are not supported in new Xcode. Choose empty application instead. Cell initialization part is not automatically generated in UITableViewController. 19 Memory Management 4:43 Memory Management has totally changed with iOS 5. release is deprecated. 20 Upload App to App Store 1/3 8:21 These three videos are very Adhoc and shows some situations not faced by beginner. 20 Upload App to App Store 2/3 8:21 That makes the process of uploading the app little confusing. 21 MapKit using IB and code 1/2 9:27 Way of Adding MapKit is done in better way from “Link Binary with Library” by selecting the Target and Build Phases. 21 MapKit using IB and code 2/2 8:04 There are many issues with mapView Method. I’ve done corrections to that and you can download this code from here. 23 Facebook Integration to your App 9:15 Either I couldn’t follow all the steps, or Xcode interaction with Facebook API has changed or some step is missing. I couldn’t make it work. Vivian is working on revised video on this. 24 AdMob Integration to your App 5:07 There are no changes in the video, everything works as it is shown in tutorial. New account signup and app creation details take little time. Once these are ready, example can be achieved very fast. 25 PList – Property List 8:07 Very Nice Simple example. works on iOS 5.1 without making any changes. 27 NSFileManager – How to work with Files. 7:29 Connects to URL and saves the content to text file. If you print [paths objectAtIndex:0] you will get the path where text file is saved. Sir, it would be really helpful if you could index videos related to db management apart from sqlite, such as XML Parser, Xcode to PHP to MySQL server etc. Hi, I found the iPhone SQL tutorials useful and well structured. Where can I download the sample source from to compare it with my notes. From You Tube with more substantive tutorials you can’t see the entire code on a single screen and hard to check for omissions. Having the source to compare is vital. Many thanks, great work and well paced. your blog is very useful to everyone. If you implement more projects on sqlite and webservices and explain to us its very very useful to us.